Jesus is asked a few times in the gospels about how a person can find eternal life – like that’s the most obvious things to ask a travelling snake-oil salesman. Maybe it is, I don’t know. It was in the first century anyway, if the gospels are to be believed. Jesus gives a variety of answers in the three earliest gospels: in Matthew 19.17 it’s ‘keep the commandments’ – those terrible, brutal laws I talked about last time. In Mark 12.30-31 he says the way to eternal life is to love God with all your heart and soul, and your neighbour as yourself. In other places he tells his audience that if you want to be forgiven by God then first you must forgive others (Matthew 6.14); if you want God’s compassion then first you must be compassionate (Matthew 25:31-46); if you don’t want to be judged, then you shouldn’t judge others (Luke 6.37). Jesus is particularly fond of this kind of measure-for-measure salvation; it’s the lynch-pin of his good news – do unto others as you would have God do unto you. And almost every time he mentions it, he connects it with the Law and commandments. Never does he say, anywhere in the gospels, that if you want to gain eternal life, or find favour with God, or be saved, then what you have to do is believe in the redemptive power of his own imminent death. Even when he could have done so, when he could have worked a little bit of Christian dogma into his teaching, he doesn’t. And that’s strange really, when you consider that Paul’s brand of Christianity – the one that’s come down to us today – is built entirely on the idea that the death and resurrection of Christ is the only thing can save us from God’s wrath. Paul looks at the old Jewish Law and says, ‘actually it’s impossible. None of us can keep it. We’re all under a death sentence for some tiny infringement of it, because any and all infringements lead to the death penalty. But,’ he goes on, ‘Christ has taken that penalty for us by dying in our place. So although the law demands we should die and then suffer for eternity, we won’t, because he died for us. Then he rose again, just as those who believe in him will.’ That last bit – about believers rising from the dead – really doesn’t follow from his premise that the Law is impossible, but this is Paul talking, a man with only a passing acquaintance with logic. He doesn’t, either, have any evidence that Jesus took the penalty for the rest of humankind – he made that bit up too. And that, in a nutshell – I do mean nut shell – is Paul’s ‘good news’. It bears no relation to the good news that Jesus preaches in the synoptic gospels. Admittedly, the Jesus who wanders his way through the first three gospels is for the most part a pre-death Jesus. You could argue, as a result, that he wouldn’t talk about redemption through his death before it had happened… but then again, why not? He talks about all sorts of other things he thinks are going to happen after he dies and rises again; he’s going to return pretty damn soon in a blaze of glory, through the clouds with an army of angels; heaven and earth are going to pass away; God is going to unleash his kingdom on the new earth. But in spite of these mad speculations, he doesn’t mention even once in the synoptic gospels that people can be saved merely by accepting that he has paid – or will pay – the penalty for their infringements of the law, their sins if you will. Never. All the more odd when you consider that Mark, Matthew and Luke were putting their gospels together long after Paul preached his particular brand of salvation. Yet they don’t put this message into Jesus’ mouth, nor do they add it to the narrative. So… were the gospel writers not aware of it? If they did know of it, was it that they didn’t like it? Did they know, in fact, that Paul’s formula didn’t square with what Jesus himself had said, or what they at least believed he’d said? Whatever it was, the result is there are two conflicting versions of the ‘good news’ in the New Testament: Paul’s and Jesus’. One is easier than the other; in Paul’s plan all you have to do is believe. The other is difficult (and if we’re honest, really only designed for Jesus’ fellow Jews); it entails things like forgiving repeatedly, showing compassion, putting others first, turning the other cheek and, especially, following the six hundred and odd commandments that make up the Law. So guess which one Christians today prefer. Here’s a clue: it’s not Jesus’ gospel – the one without the magical incantation but with the barbaric Jewish law. But if, as Christians believe, Jesus was the Son of God – maybe even God himself – then why do they always accept Paul’s reinterpretation over and above everything their Lord said? Why do they disregard all that Jesus demands of those who would follow him, and take instead Paul’s easy path? In the end, though, what Jesus and Paul (as well as the gospel writers and different factions of the early church) are in dispute about is the highly improbable and the absolutely impossible. It doesn’t matter whether they thought you could gain ‘eternal life’ by obeying the commandments or by letting someone else take your punishment for you; humans do not live forever. Just because a zealous first-century preacher thought they could does not make it so. Just because a different fanatic from roughly the same time believed it doesn’t make it happen either. There’s no evidence any human has ever, after this brief earthly existence, gone on to live forever. Equally, there’s no evidence that a deity exists, so those rules that are so important, in different ways, to Jesus and Paul can’t have originated with him. They’re man-made too. So, with no God and no eternal life, Jesus and Paul might as well have been discussing whether the tooth fairy wears a pink dress or a green dress. What does it matter when she doesn’t exist? How much more were they wrong about? This entry was posted in Bible contradictions, Christian failure, Christianity's failure to deliver, The Bible's unreliability, The impossibility of faith and tagged Christ, Christianity, Christians, Eternal life, God, Good News, Gospels, Jesus, Kingdom of God, Paul, Redemption, Salvation, sin by Neil. Bookmark the permalink. I found comfort for a time in Pauline Dispensationalism. Hi Alice. Yes, I think that’s all it really has to offer – some comfort, and comfort is not the same as truth. PD is an over-complex explanation of what Jesus was ‘really’ about, derived from a man who’d never met him. If Jesus was God (he wasn’t) then surely he’d have made such matters clear himself, in his private teaching to his disciples, for example, rather than leaving it for an outsider to do. But I’m starting to repeat my post. What do you think/believe now? Overly complex, yes, but they sure did try:) I picked and picked at the holes in the scheme until I ended up HyperD (closeted) and then Universalist (also closeted) and then eventually came out as an unbeliever. Indeed they did, just as Christians do today. They too tie themselves in knots trying to reconcile two impossibilities. Congratulations on reaching the enlightenment that unbelief brings. Have added your blog to my favourites. The Bible is not God’s Word, nor was it inspired by God. It is the words of men, giving their ideas about God, plus numerous re-cycled myths from history. Jesus is the Son of God, which requires belief in God and His powers and that He would create the male half of a human embryo to bring about the birth of a male child by a virgin woman. (This belief is a qualifying test for anybody who might want to have a relationship with God). The world seems to us to be a mess, because it was always separated from God, as the universe had to be created out of His Being. However, we too are separated from God, which is why we cannot avoid doing things that might lead to suffering, but God has made provision to bring us out of this separation and into His Presence, by believing that Jesus was His Son. In His Presence, we can have relationship with Him. This doesn’t appear to be hard to believe, but who can believe it? So if the Bible is just the words of men (which it is), then how do you know that the rest of what you write, starting with ‘Jesus is the Son of God’, follows? What you claim to believe is mainstream Christian dogma, derived from… the Bible. Without acknowledging that the Bible is in some sense God’s Word, you’ve no foundation for your beliefs. As the Bible isn’t inspired – as you concede – then why not dump the completely unfounded mumbo-jumbo you say you believe that comes from it? Some good points, however you seem to forget that Catholics believe that it is not enough just to have faith in Jesus to be saved. “Faith without works is dead”. Only Evangelicals put all their hope in the redemptive power of jesus death and ignore all other teachings. Catholics believe they should try to emulate jesus by loving their neighbor, following commandments, etc. Of course catholics have numerous strange beliefs and contradictions as well, but just saying your points in this article are made mostly from a protestant Evangelical perspective. Lots of good points, though. 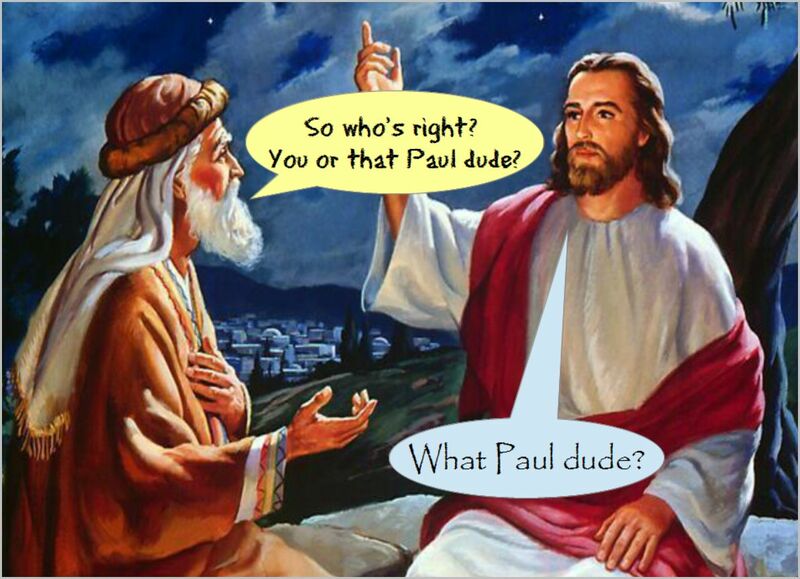 You’re right, Eric, there are very definite conflicts between what Jesus says and what Paul says (and yes, Paul also contradicts himself; we’re not dealing with entirely rational men here!) That was the point my post was making. I didn’t forget Catholic beliefs in writing it; there are many factions with Christianity that acknowledge the social side of Jesus’ message, but they all, Catholics included, compromise it with Paul’s supernaturalism. Works are relegated, even in Catholicism, to a distant second place after spiritualised salvation plans (you suggest as much yourself). The RC church, in fact, adds even more supernatural elements – Mother of God, Saints and the Holy Father, for example. When all is said and done, if people want to love their neighbour, it’s possible to do it without all this clutter and the forlorn hope it’ll be rewarded with eternal life.